It’s flyball. The fast-paced relay (think 17 seconds or less) that combines a dog’s two loves—running and playing ball—with a handler who loves a spirit of competition. 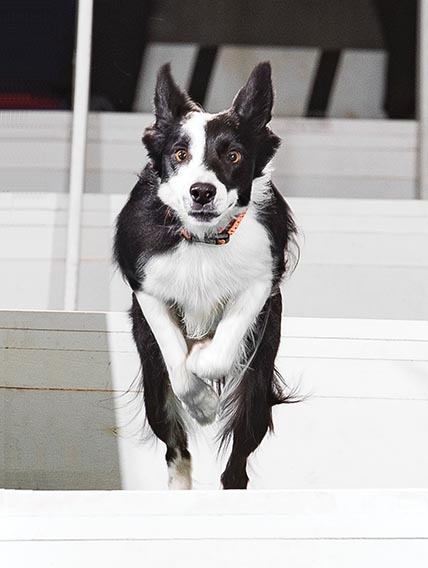 Area flyball participants are enthusiastic about the team sport that both challenges and thrills, all while providing their high-energy dog with a fun outlet he loves. Flyball is a relay race for dogs that requires speed, agility and teamwork. Two teams of four dogs each race side by side over a 51-foot-long course. Each dog must jump over four hurdles (the height of the jump is determined using the height of the shortest dog on the team) and then trigger a flyball box, which releases a ball. The dog must retrieve the ball and return over the jumps. The next dog is released only after the previous dog has returned and crossed the finish line. The first team to have all four dogs finish the course without error wins. Flyball got its start in the late 1960s and early 1970s by a group of dog trainers in Southern California when they created scent discrimination hurdle racing. It evolved into the sport it is today and was introduced in the Toronto-Detroit area by several dog training clubs. The North American Flyball Association, Inc. (NAFA) was established in 1984, and the organization guided the development of flyball in North America. Today there are more than 400 active flyball clubs and 6,500 competing dogs. Kris and Jim Bowder are the owners of Stack Attack Flyball Club, a local group of flyball enthusiasts. The group practices from 1 to 4 p.m. at Leashes and Leads every Sunday they don’t have a tournament. Kris and Jim got into flyball nearly 15 years ago. The two used to vend t-shirts and other products at animal events, and during a lull, Jim watched a flyball practice. He came back to tell Kris what he had seen and by the expression on his face, she knew they were going to get into the sport. The Bowders have eight dogs: two are retired from flyball, three are in training, and three are actively racing. Most of the dogs the Bowders have trained for flyball have been “Border Stacks,” a combination of Border Collie, Jack Russell Terrier, and Staffordshire Bull Terrier. Training a dog for flyball, says Jim, can take between three months and three years. He says that while Border Collies and Labradors tend to learn the skills needed in flyball faster, he has seen everything from Schnauzers to Great Danes racing at flyball tournaments. Besides the drive to run fast, the dogs need to be able to compete in close proximity to the other dogs. Jim says there is a psychology at work there, and part of training is to put the dog in different scenarios during practice. He also says the dog and human bond is very important in flyball. Kelly Shinn has been a member of Stack Attack Flyball Club for 2 ½ years, but she has been active in the sport for nearly 8 years. Before moving to Minnesota, she participated in flyball with her Schipperkes and a Pembroke Welsh Corgi throughout Iowa, Washington, Pennsylvania and Oregon. She currently participates in flyball with her two dogs, Rio, a Shetland Sheepdog, and Bella, a Border Collie. Holly Galbus is a Rochester freelance writer who often writes about the bond between pets and their people.